A picture would help. It could be that you have the temperature too high. The PLA sample I got from Folger said 219C on it, and this is way too hot. Around 190 works better. Could be the temp or an under extrusion. What's the material and temp you are using? My hot tip of the week: if your heat bed takes a long time to come up to temperature, try placing a paperback book on it. My second hot tip: remove the book before the printing starts. I'm running ABS - I've been increasing the temp from the default 230 and everything was looking better except the top. Tomorrow I'll try ramping the temp down to see what happens. Thanks for your help! Once I figure out how to upload a photo from my iPad I'll get some pics up. The sagging could be from not having a large enough infill % which supports the top. I used the honeycomb infill on the right and made some other refinements - mich nicer finish than the one on the left. Absolutely! That was the ticket! How did they measure? I updated my slic3r to the latest version they have on their website, 1.2.9 Stable, and have been able to print again. But still some things are not printing the software will slice then immediately say stopped working, and if I try to put multiple items on the bed to print, it will freeze and crash the software. Is anyone else experiencing this? I also ran in to another issue. I started the printer watched the first few layers then walked away from the printer. I came back and found that the print looked like crap and that towards the end of the print you can see that the x-axis started to shift to the left. I releveled the bed, made sure the belts were still tight, made sure the grub screws on the pulley were tight and started the print over. It did the same thing, but in a different spot. 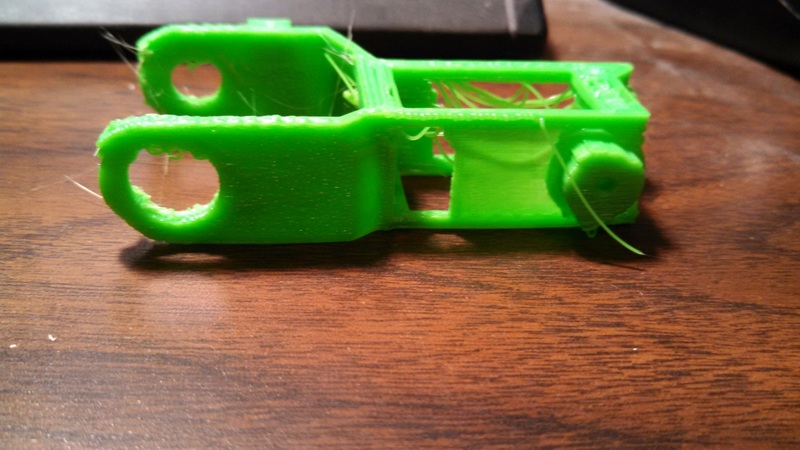 I think that it looks like there is too much plastic extruding out, this is causing the rough looking layer on the top of the print, then I noticed that as the printer is traveling it catches on these rough spots and I think that is what is causing it to shift the print. Has anyone seen this before? I am running the same settings that I had on black ABS, just swapped to green, but I would think the settings would stay the same. Can anyone help with this? I found that you need to do several things to get a nice smooth top layer. First, go into the slic3r settings and adjust the speed for the top layers. I used 20%. Then, make sure your temperature is not to high. Finally, make sure the infill is more than just a few lines (I used the honeycomb at 40% infill). Oh and one more thing, make sure the settings you are modifiying are actually being used by Slicer. The first couple times I ran it I couldn't figure out why my changes wouldn't take. The I realize slic3r wasn't using the printer settings file I was adjusting. Bed leveling will also be a huge help. I found that i first had to level my x rails because one end was higher than the other. I eyeballed that first and then made minor adjustments using the grub screws. Oh and make sure you calibrate the feed rate. Read back a few posts to figure that out. Edited 1 time(s). Last edit at 09/26/2015 08:23AM by LancelotL. An I phone case - woohoo! Only problem is that the orientation is inverted. Will work on that next. The dims are perfect. The iPhone case fit like a glove. I still need to adjust my bed about 1 mm on one corner though. I think that you misunderstood what I said, by top layer I wasn't actually meaning the top of the piece, more the last row printed. In the picture you can see what happened to the print. Towards the top of the part you can see how it shifted over during the print. Notice how the sides are rough, and the top layer in the print ended up kind of bubbly. This is what happened when I tried to rerun the print. When I noticed that I killed the print until I can figure out what is causing it. Remember when you change to a different filament, things like the quality and the temperatures that you use will be different. 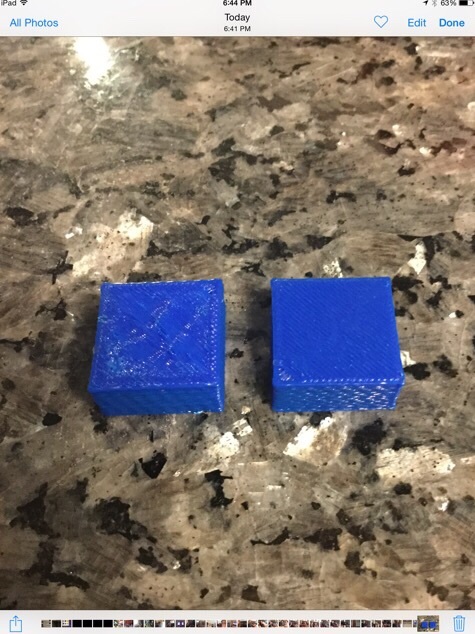 Even though the filament may be from the same manufacturer, the temperature requirements and the filament/print quality change from color to color. Also, you may want to check to see if your X axis rods are sliding back and forth in their holders. I know on my printer, the rods are not cut long enough to bottom out in their sockets allowing them to slide, so that may be causing precision problems during the print.You also may want to enable supports for the overhangs. The knobs may not fit into the other holes when you assemble the chain, due to the extra plastic and the deformation of the holes. Edited 1 time(s). Last edit at 09/26/2015 11:07AM by Mach. I did not realize that it would be different from color to color. Does anyone have base numbers to use to start on these for different colors? I think that my flow rate might be too high and that might be causing my biggest issue. I would think that temps would pretty well stay the same no? I tried printing with Ninjaflex this weekend. No go! I still use the original direct drive extruder and it just won't grab the filament tightly enough to drive it through. Probably one of the modified extruders with a spring grip would work better. Thanks go out to Tenny for this one! This set up completely solved my X axis problems! So darn simple too. One key was to move the X end stop plug from the right most set of pins to the set just to the left of that one. Those are for X axis MAX. Also in Repetier, by choosing home X to Max, it eliminates the red numbers over 200 that I was seeing. Got my bed leveled and, since I'm using those black clips to hold down my glass, I squeezed in my max dimensions to 180 by 180 and moved my end stops to clear the clips. Now all I need is a thermistor for my hotend and I can set up the extruder. I moved the bed thermistor lead over to the hotend plug so I could work the motions. Can't wait! Thank heavens that you all are here! I implemented the changes above and operationally they were fine. However my first asymmetrical prints were mirrored. I believe I read about this issue in some earlier posts so I will attempt to correct. Guys I am trying to figure out on this print of tracks for the grand kids tank out of 12 tracks it appears that 2 of the tracks got some light bridging on the drive opening. 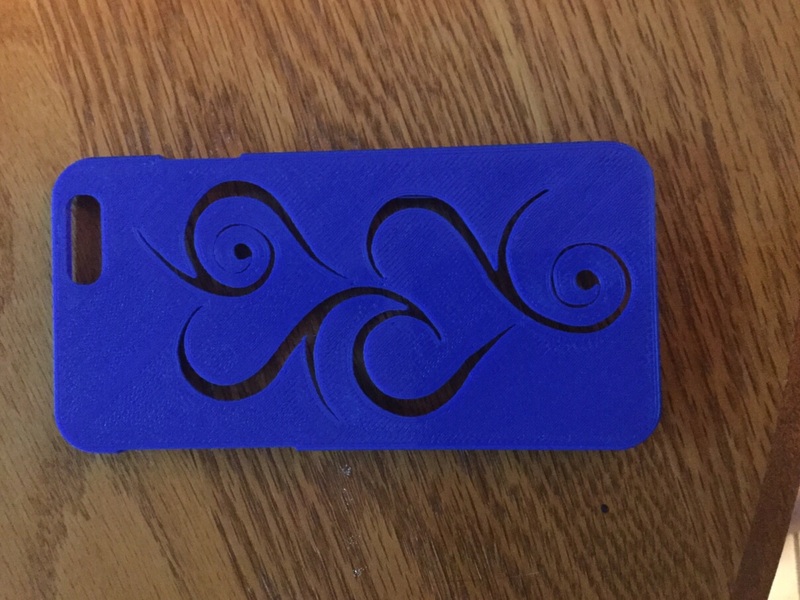 I did this print using sd card and s3d. I am printed 12 more but from the computer and got none of the bridging on the tracks. the Bridging was easily removed but I can't figure out why it happened. I am going to print 12 more tomorrow using the sd card and see if it happens again. All of the tracks measure within .02mm of each other. I just can't figure this out. if anyone can offer any suggestions on how to fix my mirror image issue I would appreciate it. I am going to try reversing a few things to see how it goes. Ok I guess it would have helped if I had implemented all of the changes - lol. All good now. I have Rhino, Alibre, Blender and OpenSCAD but not enough time to master any of them. I've used 2D AutoCad ever since it first came out in the DOS version but never got my head around 3D. Rhino is pretty cool but OpenSCAD defies my imagination. It's like programming all over again rather than a pure CAD program. Anyway, maybe this standoff will help someone. I'm still madly printing away trying to keep up with the wife's honey--do list of goodies. I do hear one Y axis bearing starting to get 'ballsy'. grrrrrrrrrrrr. I probably already have 100 hours on it. Edited 1 time(s). Last edit at 09/27/2015 03:57PM by tjnamtiw. I was in the same boat as you. Then I discovered TinkerCad. Its free and web based and VERY easy. A kid can make stuff with it. There are lesson right on there page too. Im having as much fun designing things as I am printing them. And really if you have your own printer there are going to be things you want to print but cannot find without drawing them up yourself. Also you can take stuff from thingiverse, like say a 2020 extrusion clip .stl and drop it into tinkercad and then take another object from thingiverse, say a led light switch box.stl and drop that into tinker cad too. Then you can merge the two drawings together the way you want to work for the app you want it for without spending hours trying to draw every part. Tinkercad sounds like a great tool. I'll definitely check it out. Thanks, Woodknack! OK - hit my first problem. Got the servo, Z end stop microswitch all set up. I can home X and Y on their own - both go to 0. If I try to home Z, it says Z Probe Out - bed -- I expect that, because safe homing is on. I move X to 100, Y to 100. Home Z -- no problem. It drops the servo arm, probes the bed, and is now zero. Z on my LCD shows my offset (9.89). I compared a lot of configs.. can't figure it out. Unless I'm just doing something. Whats your pre print custom G code look like in slic3r? Edited 4 time(s). Last edit at 09/28/2015 12:03AM by srcga.